I wanted to take a few minutes and pass my gratitude all the way to the top regarding the ladies of your chapter at the University of Delaware. Through the efforts of Samantha Besold and her sisters at your University of Delaware chapter, they raised more than $1,000 in money and materials which resulted in the filling and shipping of ten care packages for the Marines, Sailors and Soldiers operating out of the austere Enduring Advisor Platform-Bost, Helmand Province, Afghanistan. Our team has greatly benefited from the outpouring of snacks, drinks and essential hygiene care for which we are truly grateful. The ladies of the chapter even took the time to write more than 200 letters to those of our advisor team. 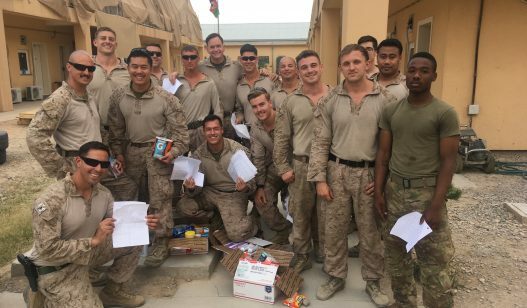 Alpha Delta Pi’s commitment to America’s troops forward deployed in support of combat operations is not only evident of their selfless service, but of the gratitude of those in Alpha Delta Pi and the Greek Life community at the University of Delaware. This has even more personal meaning for me. As an undergraduate at the University of Delaware, I was fortunate to be a founding father of Pi Kappa Phi – Theta Nu. During my first combat deployment to Iraq in 2006-2007 (which would have been my senior year), the Greek Life community had an outpouring of support with several chapters adopting my platoon. Now, on my fourth combat tour since 2006, I can say with confidence, that each and every time, the Greek Life community from the University of Delaware has supported those I served with in harm’s way. Now, with Alpha Delta Pi’s latest contribution, I can say without hesitation this has been by far the most impactful and significant contribution to date. Thank you again for having such ladies of this caliber and class in Alpha Delta Pi supporting us here in Afghanistan. Attached is a picture of some of those on the team receiving the packages.